When it comes to successful communication, you might occasionally run into obstacles, such as language barriers. It is important to always remember the following: No matter what language you speak – most of the world speaks a different one! …and this is why Microsoft created the Translator feature. 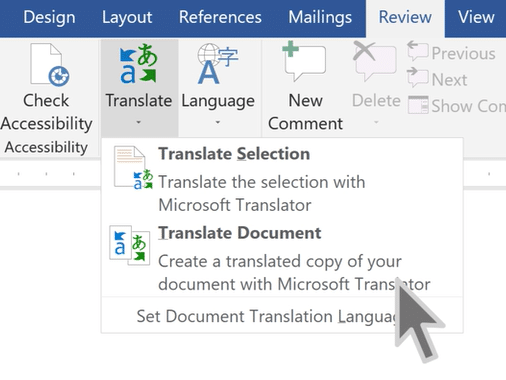 In your document, spreadsheet or presentation, highlight the cell or text you want to translate. Select your language to see the translation. Select Insert. The translated text will replace the text you highlighted in step 1. Note: In Excel, there is no Insert button, you’ll have to copy/paste the text you highlighted in step1. Select Translate. A copy of the translated document will be opened in a separate window. Select OK in the original window to close translator.